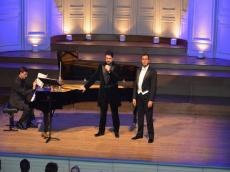 Honored Artist of Azerbaijan, opera star Yusif Eyvazov gave a concert in Paris. For the first time, Yusif Eyvazov performed a solo program at one of the most prestigious concert halls in Paris, Salle Gaveau, on February 7. The concert program included the works of the world-renowned composers Giuseppe Verdi, Pyotr Tchaikovsky, Sergey Rachmaninof, Giacomo Puccini, Gara Garayev, etc. Enrico Reggioli accompanied him on piano. In the second part of the concert, the Azerbaijani tenor shared the staged with Mexican baritone Juan Carlos Heredia, Azertag reported. Yusif Eyvazov pleased music lovers with his first solo concert in Paris. The audience gave him a round of applause. By the way, opera star will perform in Azerbaijan this May. Eyvazov and the world-famous opera singer Anna Netrebko will give a concert in Lyon on July 19. Yusif Eyvazov grew up in Baku, Azerbaijan, and received his musical education at the Baku Academy of Music. In 1997, he moved to Italy and continued his studies there. He made a series of important debuts. He starred as Canio in LA Opera's production of Pagliacci conducted by Plácido Domingo, made his first appearances at the Metropolitan Opera and the Vienna State Opera singing Calaf in Turandot, and debuted at both the Paris Opera and the Staatsoper Berlin as Manrico in Il Trovatore. Yusif Eyvazov performed at the Mariinsky Theater for the first time, in the title role of Otello with Valery Gergiev. His Salzburg Festival debut took place as Des Grieux in Manon Lescaut. On the concert stage he appeared in Parma under the baton of Marco Boemi with a program featuring works by Verdi and Puccini, in concert with Riccardo Muti. In 2017, he undertook a major concert tour throughout Asia alongside Anna Netrebko. At the beginning of 2018 Eyvazov performed on the stage of the Bolshoi Theater: in January- Renato de Grieux in "Manon Lescaut" with Anna Netrebko, in February he sang for the first time the part of Herman in the new production of "The Queen of Spades", P.I. Tchaikovsky, and Don Carlo, D. Verdi, in March. On December 7, Yusif successfully opened the season at La Scala by performing the part of André Chénier in the opera of Umberto Giordano. As a result of the close cooperation with the musical director of the production, Riccardo Chailly, Yusif debut on the Milan stage was named one of his best performances in the last few years by the critics.